A Left-Wing Comeback in Mexico’s Presidential Elections? 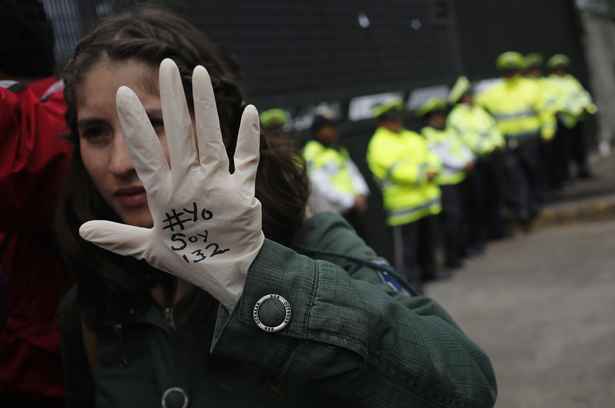 The emerging #YoSoy132 student movement has shaken up the usual staid political classes heading into the July 1 vote—maybe for good. In an unexpected turn of events, the eruption of a new youth movement has transformed the prospects for Mexico’s July 1 presidential elections. A month ago, the candidate from the old authoritarian Party of the Institutional Revolution (PRI), Enrique Peña Nieto, seemed poised to win easily by a two-digit margin and bring back the ways of the past. But after weeks of student protests against the imposition of Peña Nieto by the dominant television duopoly, as well as a series of corruption scandals that implicate the PRI, leftist candidate Andrés Manuel López Obrador has come back within striking distance. Mexico’s emerging “#YoSoy132” student movement shares much with similar mobilizations throughout the world over the past year and a half, but with a distinctive electoral twist. As in Egypt, Spain and the United States, social networks such as Twitter and Facebook have exploded with activity and facilitated the organization of youth marches and protests. Nevertheless, unlike the Arab Spring, the Mexican protests are not directed against the sitting president but against a presidential candidate. And unlike the Spanish uprisings, electoral politics are seen to be at the center instead of at the margins of the movement. Also, in contrast to the Occupy movement and Mexico’s long tradition of raucous protests, this time around the youth have been particularly careful not to disrupt traffic or take control of public spaces. The common thread running through the movement is students’ frustration at the lack of progress that has accompanied Mexico’s slow democratic transition. Mexico is today more violent, more corrupt and more unequal than it was in the year 2000, when the PRI was pushed out after over seventy years of one-party rule. The twelve years of government by the right-wing Party of National Action (PAN) has only put a new gloss on the same old authoritarian ways of conducting politics. When the PAN took control there was hope that an alternation in power at the top would at least lead to more honest government. Unfortunately, instead of starting off with an aggressive cleanup operation, Presidents Vicente Fox (2000–06) and Felipe Calderón (2006–12) quickly adapted to the old traditions of patronage, corruption and state capture. For instance, Mexico’s score on the Transparency International Corruption Perceptions Index has fallen from an already low score of 3.7 (out of 10) in 2001 to a dismal 3.0 in 2011, now tied with Malawi and Madagascar. The bitter failure of the drug war, which has led to more than 60,000 violent deaths over the past five years, is only the most glaring example of the profound institutional weakness of the state, which was inherited from the PRI and has been aggravated by the PAN. Only 5 percent of crimes are eventually punished in Mexico, according to a study conducted by the National University, and only 35 percent of Mexicans trust the police, according to a recent Gallup poll. The government achieved only seventy-nine convictions for money laundering, out of 1,376 investigations conducted during the first five years of Calderón’s administration, from 2007 to 2011. In such a context, rolling out 45,000 soldiers onto Mexico’s streets and highways has only made the situation worse by provoking the criminals. Calderón’s decision to privilege brute force over the rule of law has led to a dangerous arms race between the government and the organized crime syndicates as well as territorial disputes between drug gangs, which have destroyed the social fabric in entire regions of the country. The PAN administrations have also taken the dangerous move of breaking with Mexico’s long tradition of separation between church and state as well as with the post-revolutionary military-civilian pact. Fox first laid out the welcome mat for the church hierarchy by giving priests an unprecedented public voice. He famously bowed before Pope John Paul II and kissed his ring during the Pope’s visit to Mexico City in 2002, demonstrating subordination of the Mexican state to a foreign authority. This implied a major historic transformation, since one of the principal objectives of the Mexican Revolution of 1910–17 had been to limit the economic, cultural and political power of the Roman Catholic Church. This year Calderón invited Pope Benedict XVI to Mexico only days before the beginning of the presidential campaign, clearly intending for the visit to give a political boost to his party. Throughout Latin America, the church and the military historically have been the two central pillars of authoritarian politics. Their contemporary empowerment puts Mexico’s democratic institutions at risk, since they can now step in at any moment if they perceive a threat to their core interests. The Mexican people are eager to finally taste the fruits of democratic transition and are ready for an authentic regime change. Up until a month ago, the PRI had successfully presented itself as a credible option to move forward. Their young, telegenic candidate, Peña Nieto, had garnered the support of the corporate media, the local robber barons and has aggressively courted the support of the US government. But Peña Nieto’s image has quickly crumbled. A series of corruption scandals paint the candidate as just another corrupt old-guard politician. The US Drug Enforcement Administration, along with Mexican authorities, is currently investigating possible complicity between three former governors of Tamaulipas close to Peña Nieto and the Zeta drug cartel. The former governor of Coahuila, Humberto Moreira, whom Peña Nieto had named as president of the PRI, has been caught up in a corruption scandal that left his state $3 billion in debt. And this June, three top Peña Nieto aides were accused of fraud in US courts for allegedly diverting campaign monies to their own pockets. The Guardian’s recent exposé of alleged payments by the PRI candidate to the principal television networks in exchange for positive coverage has also demonstrated that his “clean” public image is more of a media fabrication than a reality. The vast majority of Mexicans use television as their principal source of news, and 95 percent of broadcasts to Mexican homes are controlled by only two companies, Televisa and TV Azteca. One of the principal demands of the #YoSoy132 movement is precisely for these companies to stop their blatantly biased coverage of the campaigns in favor of Peña Nieto. In response, Peña Nieto has left behind his original campaign message based on “change” and now talks only about being a “winner.” He no longer even pretends to represent something new. In addition, in a gesture to the US national security establishment, which has become increasingly worried about the possibility that Peña Nieto might cut deals with drug bosses, the PRI candidate has announced that former Colombian police chief Oscar Naranjo will be one of his top law enforcement advisors. Naranjo was the top cop under the right-wing Alvaro Uribe administration in Colombia and has been named a “special agent” by the Drug Enforcement Administration. Meanwhile, the PAN’s candidate, Josefina Vázquez Mota, has played the gender card by using “different” as her principal campaign slogan. Despite the interest generated by the fact that this she is the first woman to run for president on a major-party ticket, polls show that Vázquez Mota is apparently doomed to pay for the multiple failures of the last twelve years of PAN governments. López Obrador has also taken the bold move of naming his cabinet before election day. Many of the leaders he has chosen were previously close to either the PRI or the PAN, but have become disillusioned with both parties. They have openly stated that they support López Obrador in the hope that he could become the equivalent of Luis Inácio Lula da Silva, who successfully jump-started economic development in Brazil from the left. The survival of democracy itself is at stake in Mexico’s presidential election. In the past, the outgoing president personally decided who his successor would be. Today, the power elite fulfills the same function by managing the transition between one president and the next. Peña Nieto is the candidate who assures continuity for the ruling class. Former president Fox and other leading members of the ruling PAN party have even publicly endorsed Peña Nieto. Independently of one’s political views or preferences, and despite López Obrador’s overly bland rhetoric, a victory for the left would bring a much-needed sea change to Mexican politics and renew hope in the future of democracy. In contrast, a victory for Peña Nieto would be cause for alarm. The central question is whether there will be an extension of the rule by the same elites who have dictated Mexican politics since the 1940s, or whether the opposition will finally have the opportunity to try its hand at governing.